PCN Flight West: NWA Capt. William F. Hochbrunn Jr.
NWA Capt. William F. Hochbrunn Jr.
NWA Capt. 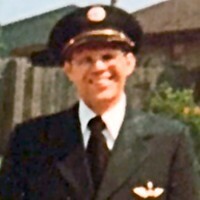 William ‘Bill’ F. Hochbrunn Jr.
News has reached our group with the passing of RNPA member retired Northwest pilot Captain William Frederick Hochbrunn Jr., age 96. Captain Hochbrunn joined Northwest Airlines 02-25-1942. Widowed in October 2003 with the passing of his wife Bette Lue, Captain Hochbrunn is survived by their children, grand- and great grandchildren. Services are planned for this Wednesday, March 28th in Bloomington, Minnesota...please see information below. Hochbrunn, William F. Jr. age 96 of Savage, MN, entered into the loving arms of the Lord on March 22, 2018. Preceded in death by the love of his life, wife, Bette Lue; son Thomas; granddaughter, Kristin and brother Donald Hochbrunn. Survived by daughters, Renee Hall (Donald), Phyllis Hochbrunn and Keely Jo Gregory (Jeff); 14 grandchildren, 14 great-grandchildren; sister-in- law, Junice Hochbrunn; many nieces and nephews. While William's love of flying was evident in his 40 years with Northwest Airlines, he placed the love of his family above all else. In lieu of flowers, memorials preferred to donor's choice. Interment Dawn Valley Memorial Park. Visitation 10:30-11:30 AM with funeral service at 11:30 AM on Wednesday, March 28 all at: Washburn-McReavy.com Dawn Valley Chapel 952-941-7686 9940 Bush Lake Rd., Bloomington MN.